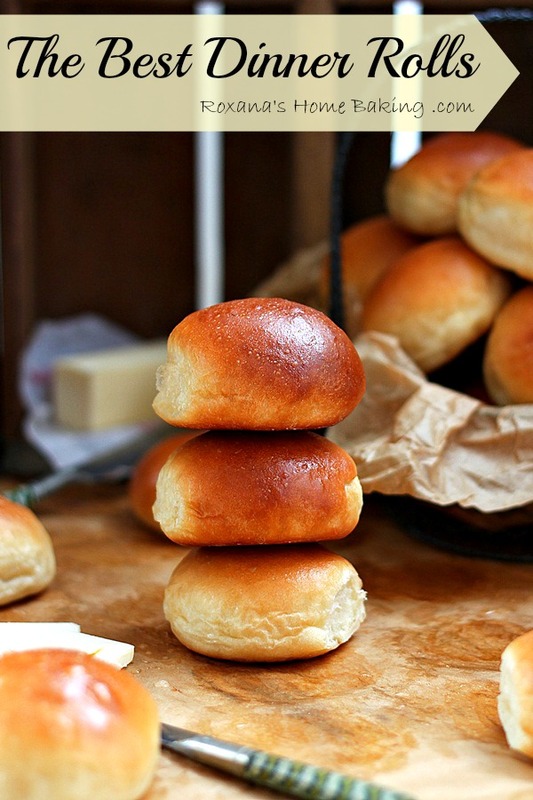 Soft, buttery, tender and warm, straight out of the oven – these are the best dinner rolls! 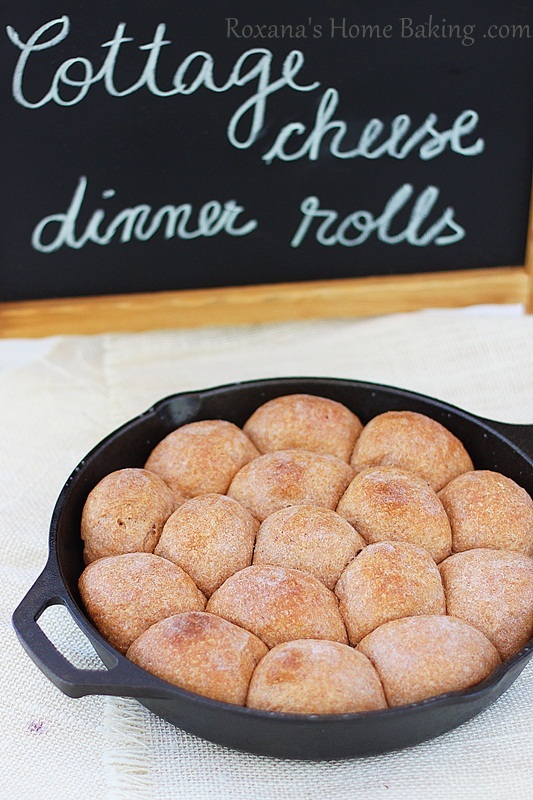 Once you try this dinner rolls recipe you’ll never want to go back to store bought dinner rolls! I try to avoid adding “the best” in front of my recipes, actually I’ve never done it since every person has a different opinion of what’s “the best” but these dinner rolls are the best! There’s absolutely nothing you can do to improve the taste. They are PERFECT! Soft, tender and warm, straight out of the oven while the butter is still running on the sides – this is what I call dinner! I’ve been working on this dinner rolls recipe for a couple of months now and I’m pretty sure I’ve made them 10 times so far. My family asks for them at least once a week when dinner time comes around. Before I developed this recipe we always relied on the buttery dinner rolls I’ve shared the recipe with you in the past, which it’s still the quick version to great dinner rolls. Today’s dinner rolls takes a little bit of time, it’s a little more work involved, but the results are so worth it! When I first cam up with this idea I wanted to make a buttery, brioche-like soft loaf of bread but somehow I had a hard time finding the right pan size for it. It was too much for a standard 9X5 inch loaf pan and too small for two 8×4 inch pan loaves. After a few more trials, I decided to shape the dough into small dinner rolls instead of one loaf. Best decision ever! And you know what’s even better? You can freeze the rolls just after shaping and bake them as needed. Isn’t that great? I make two batches of dough, shape and place them on baking sheets, cover well in plastic wrap and freeze. When I’m in the mood for fresh-baked dinner rolls (it happens more than I should admit) I just take the baking sheet out of the oven, unwrap the plastic and leave at room temperature for about 1 1/2 hours and bake as fresh. These dinner rolls have a little twist. Of course, they need flour, yeast (afraid of baking with yeast? Read Bread Baking 101- baking with yeast) , water, eggs and butter but also a secret ingredient: Greek Yogurt! Yes, you read that right, I’ve added some to increase the richness of the dough without adding additional eggs or butter, not that eggs and butter are a bad thing when it comes to baking, no, no, no! I just wanted to see if adding yogurt to the dough will keep the final results moist longer, as it does for cakes or cupcakes. I can honestly say that these are the softest dinner rolls I’ve ever had or made, but can’t guarantee how long they stay soft since they disappear in no time. The longest we had some were for two days and they were still soft. If you manage to keep them longer, please let me know if they are still soft. 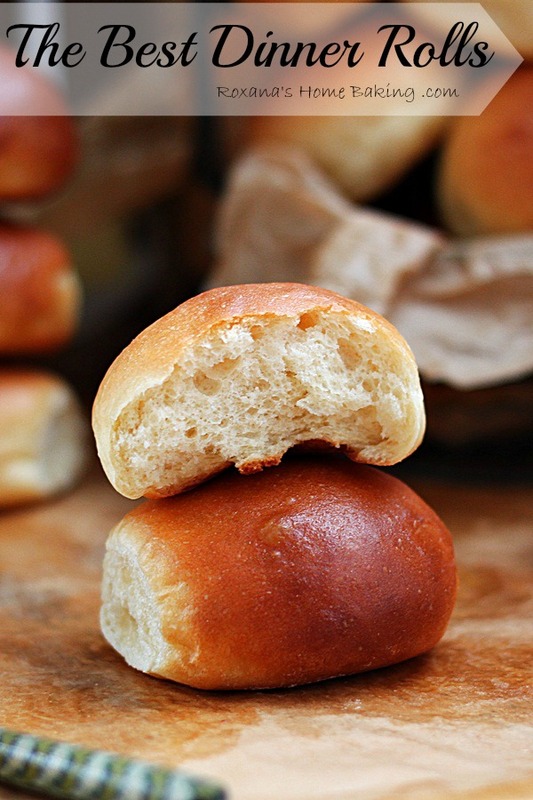 Soft, tender and warm, straight out of the oven - these are the best dinner rolls! In the bowl of your stand-up mixer , add 1/2 cup flour, 1/2 cup lukewarm water and the dry yeast. Mix to combine and leave at room temperature until bubbly and has a sponge-like texture. In a separate bowl whisk the eggs with the yogurt, salt, sugar and the remaining 1/4 cup water. Fit your stand-up mixer with the dough hook and turn it on to the lowest speed. With the mixer running, add the wet ingredients to the yeast mixture. It's going to be a very sticky batter. Gently, on the lowest speed, add the 3 1/4 cups of flour, little by little. When all the flour is added pour the 4 tbsp of melted butter and slowly increase the mixer' speed from low to high. Keep mixing for 2-3 minutes and turn the mixer off. With a wooden spoon or a spatula, clean the sides of the bowl, scraping down the sticky dough. Turn the mixer back on and mix on medium-to-high for another 2-3 minutes or until the dough will start to clean itself from the sides of the bowl. 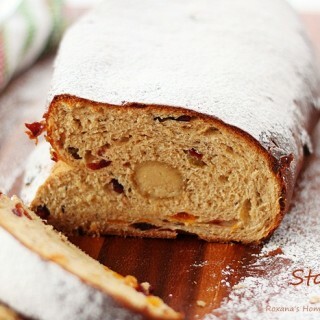 It's still going to be little sticky, don't be tempted to add flour. With the help of a spatula/wooden spoon put the dough into a clean buttered bowl, cover with plastic wrap and leave at room temperature for about 1 1/2 hours or until doubled in volume. Punch down the dough and, with floured hands, take the dough out of the bowl and place it on a floured surface. Now divide the dough into 20 pieces, shaping each one into a ball. Place them on baking sheet (at this point you can wrap tightly in plastic and freeze for future use) cover again with plastic wrap or a tea towel and leave at room temperature for another 30-40 minutes. Bake the rolls for about 20 minutes or until golden. As soon as you take them out of the oven brush them with the salted butter. Beautiful! Cant wait to try these! These are stunning rolls! I HAVE to try them!!! 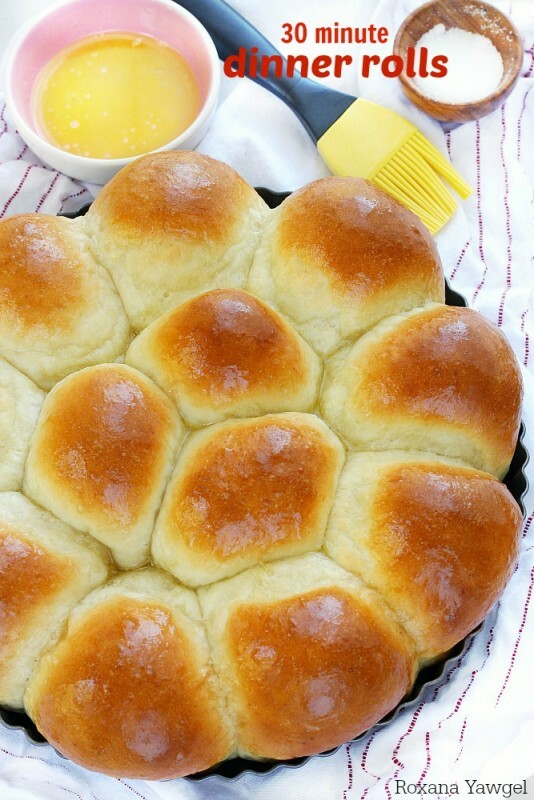 Dinner rolls are the best, especially for holiday dinners with the family! These look mouth-watering! 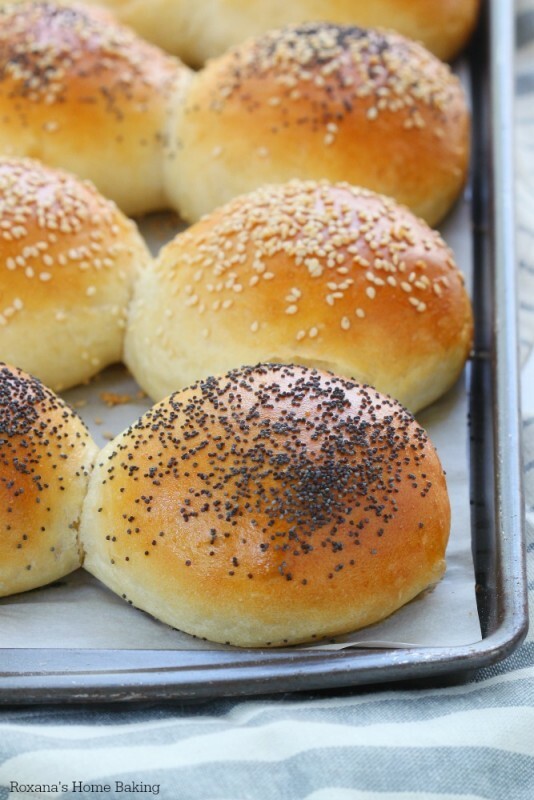 I old love to try making these rolls but I do not have dough hooks. Can I use my regular beaters? I guess they're whisy like. The one's that came with my beater which I use for mostly for cookies and whip cream. Thanks so much Roxana. I love your website! Hi Roxana, I don't have a dough hook either, but I do have the paddle attachment to my stand mixer. Will that work? Thanks! 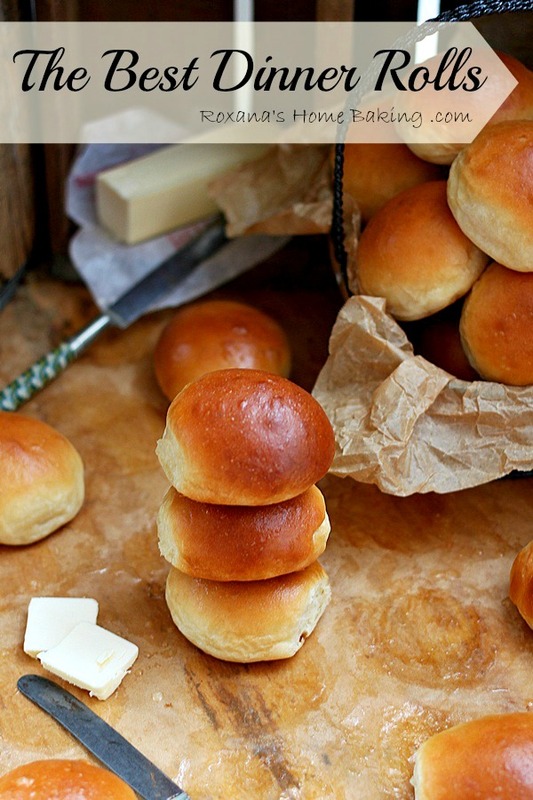 I would love to try making these rolls but I do not have dough hooks. Can I use my regular beaters? Roxana, these rolls look FASCINATING! I'm just tempted by their photos and how you described them. I'm intrigued by adding greek yogurt to the dough. Pinning it to try next weekend! These are simply stunning, Roxanna! I love homemade rolls! I collect cookbooks and always looking for good baking recipes. 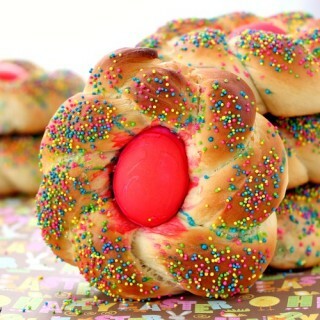 Beautiful buns, Roxana! I mean, your dinner rolls!!! 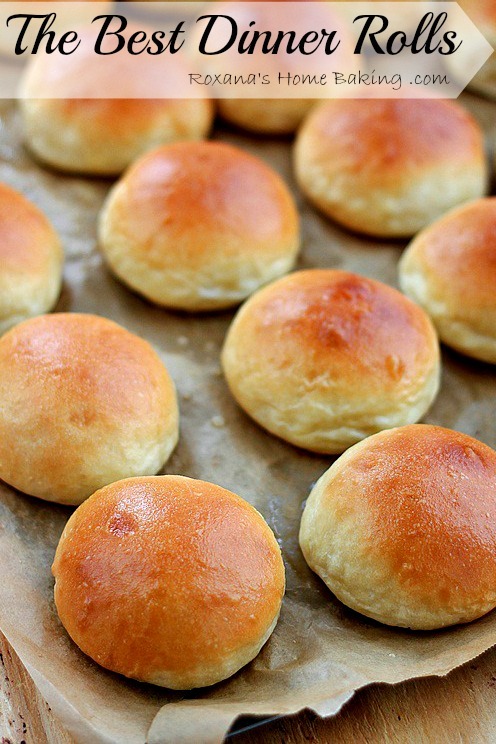 I have wonderful childhood memories with these kinds of dinner rolls. It reminds me of the steak house dinners my dad used to take me to as a child. these buns always come on the side with butter - and I was usually too busy stuffing myself with these! I know they are delicious!!! These look fantastic! I adore a good quality dinner roll and this looks like that might be it! When you say the best, I believe you! I simply love how they look and I can almost smell the aroma coming from the oven when they are baking. 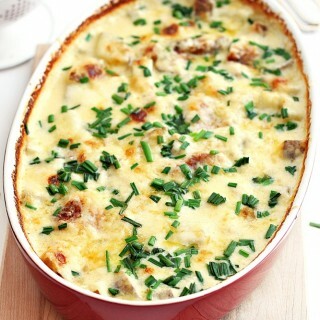 Wonderful recipe and gorgeous pictures Roxy! Have a lovely week!!! Oh my these look gorgeous!!! I need to make these stat. I loved my mom's homemade rolls, and I cannot wait to try your recipe. The smell of bread baking in the oven is heavenly! Gorgeous rolls! I am in the mood to make more bread this week! homemade dinner rolls are the best! There is quite nothing like them. I have a drawer FULL of yeast packets that were sent to me... now I have no excuse to keep baking with it. ;) LOVING the greek yogurt here! Hi, How long can you keep these so the taste dont change and they are all fresh? Oh Roxana these are really the best dinner rolls. I have never come across something so appetizing like these. I am bookmarking this one. Great pictures too.. makes me crave for some right away. Do you think fat free greek yogurt wud work ? I just have them handy so checking with you. Please let me know. These are absolutely stunning! I love their golden hue and can only imagine how moist and flavorful they are. Homemade rolls are SO good. Love love love them! Do you know how much I would give for one of these rolls right now!!! These are heavenly, Roxana! 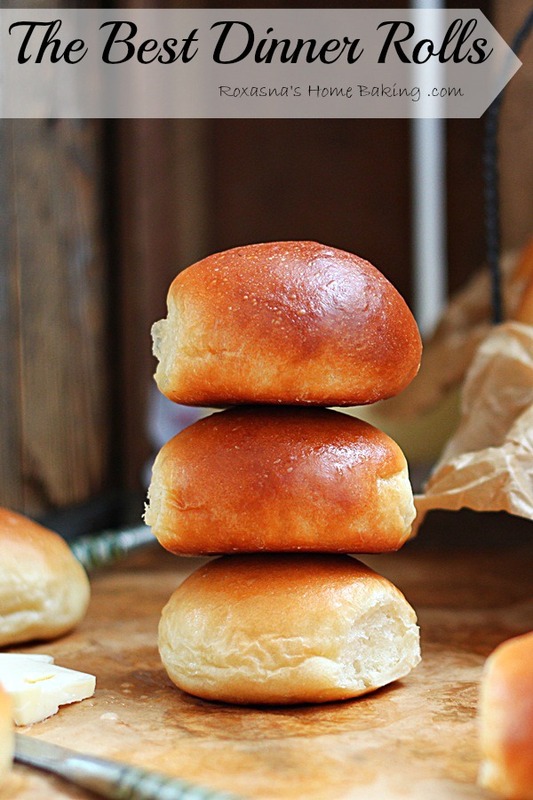 These rolls are so beautiful - I love their golden coloured, shiny tops. I have a tub of Greek yogurt at home just crying out to be used in this recipe. Thanks for sharing, Roxana! Roxana-I made these last night for dinner! They are truly the best rolls ever! These rolls look so amazing, I love that you added Greek yogurt! These look delicious. I am stopping by from the Tumbleweed Contessa. Could I make it without the Greek yogurt? You always amaze me with your bread making prowess! These are beautiful!!!! Perfect for Easter! 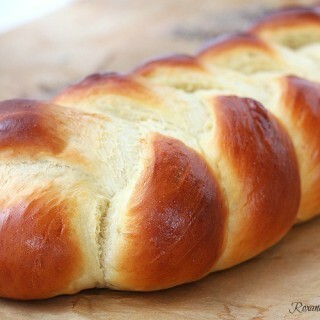 Fabulous, I'm quite crazy about any type of brioche, these look amazing! Very sticky dough indeed! I started to make the mistake of picking the dough up with my hands to move it from the mixer to the buttered bowl. Very good rolls, thanks. Oh goodness. Those buttery tops! So yummy looking. And Greek yogurt in rolls?! Whaaat. I have to try these! I was wondering if I could toss the frozen rolls into a ziploc bag for storage instead of keeping them on the baking sheet? I have made these buns twice now, and they really are the best buns that I have ever had or made. My husband loves them, thanks for the recipe! I made these today and they are yummy! I baked half of them and put the second half in a muffin/cupcake pan to freeze. It's a good thing I didn't bake them all. They would be gone tomorrow! Thank you for the wonderful recipe. Roxana, Do you need to grease your pans before baking the rolls. Also, when you're baking bread should the pans be greased (with butter and flour) or just butter? I bake my bread in a cast iron pot. Thanks for your assistance. Love your web-site page. How long do I bake from frozen? At the same temp? Hats off to you! These are very good. My husband praised them highly. Thank you for sharing. I worried there wasn't enough salt in it, but decided to follow the recipe. Just right. I have some in the freezer for another day. Since the optional 2 T. butter for brushing the rolls specifies salted butter, should I use unsalted butter for the 4 T. melted and cooled butter? 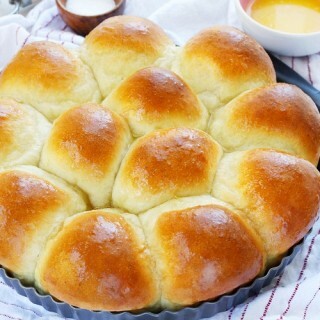 The rolls look delicious, and I can't wait to make them.Thanks! Roxana, I appreciate your reply, and I agree with you. However, I was hoping to find out if the 4 T. butter (the next-to-last listed ingredient) should be salted or unsalted. Thanks again! can you keep this dough In the refrig over night and, bake the next day? Hi Diana, Yes, you can leave the rolls in the fridge overnight, but no longer than 8 hours, or they will rise too much. Am I able to let the dough rise in the fridge overnight and bake the next day? Hi Roxana, is it possible to make these without the yogurt? I don't have any. Made these delicious rolls yesterday and I should have doubled the recipe. Came out perfect. But the sticky dough is a challenge. This is a recipe that I will be making many times. I used honey greek yogurt as that was all I had and it tasted great. Thanks for sharing. Well I figured it was time to comment. 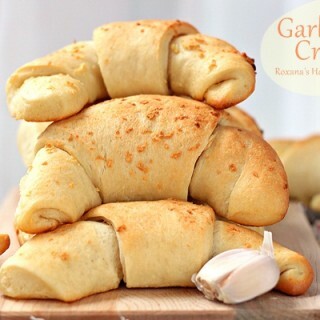 I've made these about half a dozen times and they are always DEVOURED! Even after everyone is done with dinner, the rolls just tempt you to eat one more! This is my go to recipe for dinner rolls now, and they turn out gorgeous every time. The only thing I do different is put them together in a baking pan cause I like my rolls very tall and stuck together. :-) Thanks for the great recipe! Excellent! I hope they work wonderfully for you! The thing with rising/baking them in a pan is that they tend to rise UP instead of sorta out and up. 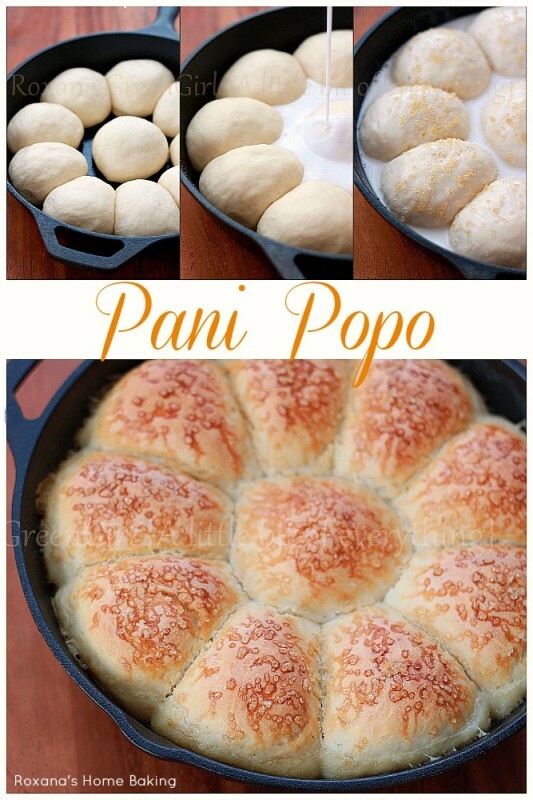 Makes for huge delicious pillowy rolls! Just like my favorite local bakery! I dont have any greek yogurt but I believe a substitution of sour cream would also work. Hi Roxana, We are snowed in for at least another day, and I wanted to make these tomorrow, as I have all the ingredients :) My question is about doubling the recipe, I am feding two teenagers, and they will demolish anything fresh baked lol Can I doubel all the ingredients, instead of making two separate batches? Thanks. I just made these and they turned out amazing. Thank you for sharing the recipe. I can't stop eating them! The best rolls I've made so far. These taste much better (to me) right out the oven. Betty Crocker has been shown up by Roxanna! Superb recipe. I've just made these today and they came out perfectly perfect! Thank you. These look amazing! I'm in!! Thanks for sharing! Look yummy!! but how to treat the frozen dough in future? Do I need to defrost them first and then cover with a towel and leave at room temperature for another 30-40 minutes before bake? Thank you. I need help, ASAP!! I have used this recipe today to do a test run for the big turkey day tomorrow. The only thing I did not use was the yogurt, but I subbed in an extra egg. The rolls taste great.. but they are super hard on the outside. Not uncomfortable, just a bit crunchy.. but rolls shouldn't really be crunchy. Is there anything I could do? Like i said, they just flew right out of the kitchen. Made 16 and I think there's only about two left, but i'm still just not comfortable with the crunchy. Is there anything different i could do tomorrow? Decided to try this on a whim for Thanksgiving dinner. Added 3 1/2 cups of flour by mistake, but doesn't look like it will be a problem. Next time I will put on my glasses! I will let you know how mine turn out, but I have a feeling they are going to be great! Happy Thanksgiving! How did the rolls turn out, Jennifer? They were delicious! I started to reply that day and my computer would not cooperate, so thanks for asking. 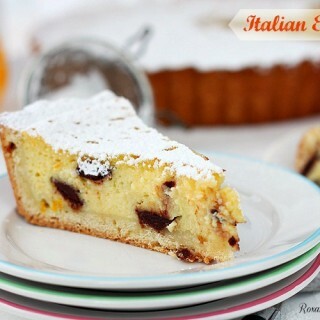 This was a great recipe that I will definitely use again and again! They would be really delightful with fresh strawberry jam, so I'm eager to try that! Blessings to you and thanks for sharing! These look great! Should the baking sheet be greased or not? Thank you. I use parchment paper on my baking sheets, but if you don't, I suggest lightly greasing the pan. I worked them and I am thrilled, beautiful appearance and taste, when you bite ... yummy ... beautiful texture. 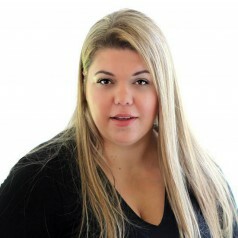 Highly recommended, thanks Roxana! Hi Roxana, you have the 'Best Dinner Rolls' indeed. I made the recipe over the weekend, however, I shaped them into 6 hamburger buns. The rise was beautiful and big with superb structure (I probably could have shaped 8 buns for a more standard size), the crumb buttery, and soft. The burgers were loaded with fixins' to which the buns held everything together nicely. Thanks for sharing the recipe―it rocks! When freezing these do you let them rise first or freeze them when they are still small? Can I mix this on the dough cycle of my bread machine adding liquids and dry ingredients per bread machine directions? Also, do they do as well if you freeze them first? They sound amazing! Can't wait to try! Thanks! Hi Dianne, I have never used a bread machine so I don't know what to advise you. Sorry. And yes, if you freeze them, once you bake the rolls later they are just as good. Just make sure you they don't get freezer burns and you let the rolls rest at room temperature to thaw and let the yeast do it's work before baking them. Thanks Roxana. I just wanted to make them ahead and freeze them for Thanksgiving. Maybe I'll give them a trial run in the bread machine. Roxanne, I am a total newbie in the kitchen and been given the task of hosting and cooking this year. I really want to do this but since I am new, I dont have the gadgets you use. Is it possible to do this all by hand? Thanks and Happy Thanksgiving to you and your family! Thank you for the responding in such a timely manner, Roxanne! I've been commenting pinterest worthy articles for a long time and you actually respond plus in a ridicuously fast manner. Huge thanks for that!!!! I am definitely doing that 30 minute dinner roll. Wish me luck. Can I use my beaters? I just made them for the first time and they turned out great! They look beautiful and taste delicious!